Focus on relaxing with a Facility Management contract. For a single price, we provide complete staff, supplies and maintenance for the summer. Welcome to Positively Pools, Inc. We are a commercial pool management company dedicated to making community swimming pools a safe and clean place to enjoy. Positively Pools, Inc. has committed itself to providing a service that the customer can depend on and feel good about. Your job as a lifeguard is to provide a large part of this service. To do so, you will be trained to maintain facilities, manage large crowds, problem solve any issue, and if necessary save lives. You will be provided with every advantage in learning and training as well as constant onsite visitation from adult supervisors. We will also have weekly meetings and awards for motivation and social occasion. Positively Pools is not just a place to work. We are a culture of Goal-Driven accomplishment and motivation. We are a responsible member of the community. We hope to be more than just a part-time job to our Lifeguards. Our intention is to instill life-skills into our employees and show them how to be a productive employee and member of their community. Positively Pools is both a stepping-stone and a familiar home for all who work here. We challenge our employees to explore and exceed their limitations and learn valuable life lessons. We are fair and supportive of our employees’ motivations and goals with their job here as well as their life beyond the company. Lifeguards develop skills that are useful in daily life. Lifeguards are directly responsible for the safety and cleanliness of the community pool and becoming fully certified in Red Cross Lifesaving, First Aid and CPR. Head Guards are experienced lifeguards that supervise a pool staff. Head Guards make sure the community receives the best the company and staff has to offer. 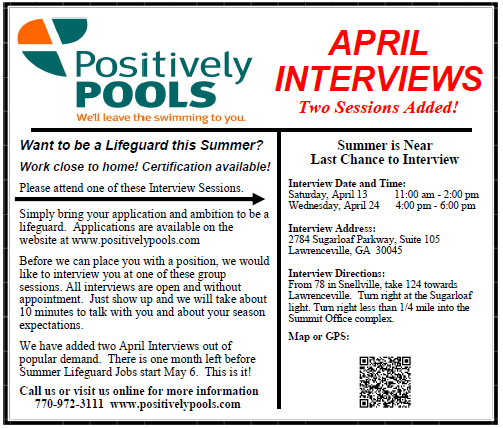 Lifeguards are encouraged to rise through our ranks at a pool to one day become a Head Guard there. Supervisors oversee a group of 10-15 pools handling routine visits to direct positive job performance while being on-call to handle immediate problems as they arise. Supervisors are ambassadors to the company or community members. Outstanding people skills are required. Service Technicians use and develop mechanical skills while keeping pools clean and usable in addition to repairing problems as they arise. Please download our employee application here.